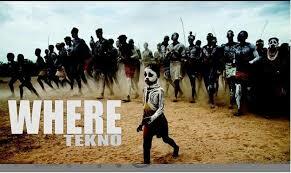 Tekno – Where MP3, Video & Lyrics - Nitracle - Download Apps, Play Games, Watch Movies, Listen to Music & Connect with People. Where your mama dey oh? Where your papa dey oh? Where your sister dey oh, eeh? Where your brother dey oh? Mallam can't change it, eeh-eh "Can't change it"
Mathematics can't solve it, eeh-eh "Can't solve it"
Sniper cannot shoot it, eeh-eh "eeh-eh"
So that, me and you can dance it oh, eh "I love you, baby"
Sho'ni duro ti mi oh? Baby boo, na you be my heart oh "No, no-no"
Girl you give me life oh "give me life oh"
Eshim m'aka Tengere, oh "Tengere"
eeh Tengere ooh, eeh "Tengere"
Is the kind of thing I want to see "We dance, I'll pray"